From Blunderbuss to Bazooka . . . and Beyond! GURPS High-Tech is a sourcebook for the technology that extends man's mind and hands. On the battlefields of 14th-century Europe or in the lonely alleys of 20th-century America, adventurers need the best equipment. Whether the problem is navigating the trackless seas or stopping the monster cold in his tracks, GURPS High-Tech has the gadget for the job. This book details the period from the ascendance of gunpowder (Tech Level 4) through the modern era (Tech Level 7). Personal Weapons – From the matchlock musket to the assault rifle, with rules for loading, firing, malfunctions, and special weapon and ammo characteristics. There are complete descriptions and game stats for more than 100 small arms, including a few military weapons that won't be issued in this decade! Personal Armor – The development of gunpowder made body armor obsolete . . . or did it? High-Tech details many varieties of personal armor, including today's (and tomorrow's) high-protection combat vests. Heavy Weapons – From the muzzle-loading cannon to the homing missile . . . along with rules for weapon crews, forward observers and tacticians. There are complete descriptions and game stats for more than 50 heavy weapons. Explosives – Complete rules for determining the explosive force of anything from a firecracker to an H-bomb, both in real-world terms (tons of TNT) and game terms (dice of damage). Communication and Vehicles – High-Tech traces the development of trade and transport, from heliograph to cellular phone, ox cart to space shuttle, in enough detail to let players and GMs know what is available or feasible in any period. Medicine – A concise survey of medical techniques and capabilities for each period. Tools – The "don't leave home without them" devices of every period, from flint and steel to the transistor radio. 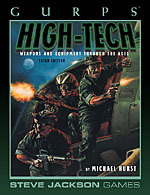 GURPS High-Tech is designed for use with the GURPS Basic Set, Third Edition. However, aside from specific game stats, this sourcebook will be valuable to any roleplayer or Game Master. Descriptions have been made as detailed and informative as possible, for easy conversion to any game system. GURPS High-Tech – The Fourth Edition version of this book, with descriptions and stats for hundreds of kinds of historical weapons and personal armor, vehicles from the stagecoach to modern helicopters, and much more.